If you're like me and enjoy keeping up to date with technology and especially all of the ins and outs of the iPhone, 3ight's helpful app Tips For iPhone - Tricks And Secrets is a must! You'll learn everything you wanted to know about the device. Scroll and read through awesome tips and helpful hints to iPhone secrets. Select specific tips through their Categories menu. Mark your Favorite tips for later quick viewing Vote to Like and Dislike individual tips. Share your favorites on social networks. 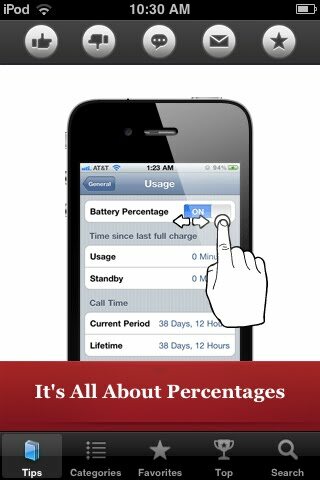 The battery percentage meter can be shown with a number along with the colored indicator to give you an exact idea of how much battery life is left in your iPhone. 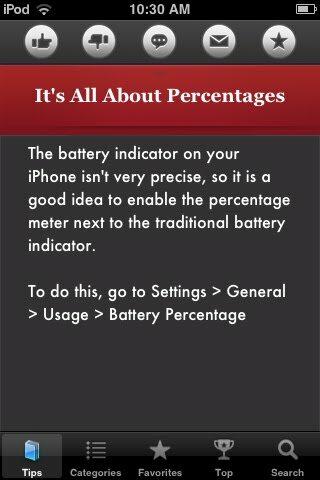 Read step by step instructions that help guide you through each new trick, In this case the battery percetage indicator. Launch iTunes! 3ight.com Coming Soon!